Kamu Grugier-Hill is looking for a bigger role this season. 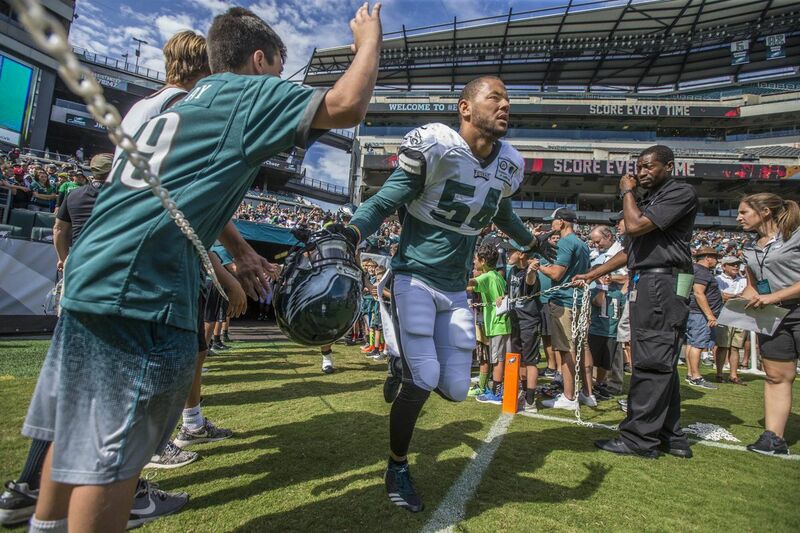 Kamu Grugier-Hill, one of six linebackers who made the Eagles' 53-man roster, was only credited with a single snap on defense during his rookie season last year, and even that came with an asterisk. In the opening game against Cleveland, a game in which Grugier-Hill made his NFL debut by going out with the special teams for a total of 10 plays, the Browns faked a punt early in the second quarter. The ball was direct snapped to running back Duke Johnson, which made the play technically an offensive play rather than a special-teams play. Whatever the terminology, you could call it a success for Grugier-Hill, who shot through the line and dropped Johnson for a 6-yard loss, earning him the distinction of having a solo tackle on every defensive play of his career. That's interesting and everything, but Grugier-Hill would be just as happy if his personal slice of perfection didn't last. Like all football players, Grugier-Hill wants to play, and for him, as a safety in college and now as a converted linebacker, that means playing defense the whole game. He'll have to wait for that day, though, if it ever arrives, and enjoy what has gotten him a job in the league. "When we look at Kamu, we think he has a chance to be not only one of the better special-teams players on our team, but in the league," Howie Roseman said after the final roster was announced. Grugier-Hill's development last season, from an untested rookie to a special-teams mainstay, is one of the reasons the team felt comfortable letting Bryan Braman, who had been the alpha dog on Eagles' special teams for three seasons, leave in free agency. It is the reason he made the roster ahead of Nathan Gerry, a fifth-round draft pick who cleared waivers and is now on the practice squad. "That's my mindset about how it's going to be this year," said Grugier-Hill, who, at 6-foot-2 and 220 pounds, brings an impressive combination of speed and physicality. "In my career, I want to be the best at what I do, whether it's defense or special teams. If they want me to be the best, that's how I'm going to do it. Believe that I'm the best, we're the best, and we're going to dominate." Grugier-Hill grew up in Hawaii as a multisport athlete and didn't play football until his junior year of high school. He played well enough to earn a scholarship to Eastern Illinois as a safety and was selected first-team Ohio Valley Conference after his junior and senior seasons. The Patriots took him in the sixth round of the 2016 draft and he stuck all the way to the final cut before being waived. The Eagles claimed him the next day, and seven days later, he was dropping Duke Johnson in the backfield on the fake punt in the opener. "Last year, I didn't know what to expect going in. This year, I've been with the guys for a while now and we're working on a lot of good things," Grugier-Hill said. "They're definitely holding me to a higher standard on special teams now, so I'm ready for that role." At the moment, there's no room for Grugier-Hill on defense, but he's faster than Nigel Bradham and more instinctual to the ball than Mychal Kendricks. Both of them are starters, along with middle linebacker Jordan Hicks, but who knows? "We've got a big group of guys and I tried to do my thing in preseason and help where I could," Grugier-Hill said. "Coach [linebackers coach Ken Flajole] sees me more as a cover guy. So, if a time comes where we're playing a team where we need more coverage, I could definitely see that happening. I'll go game-by-game and learn the game plan, and if a game comes up where they ask me to fill a role, I'm going to do that." Until then, he'll fill the gaps on special teams, hoping to make himself visible on every play. That's what the best special-teams players can do, and that's what the Eagles expect of him. Getting a tackle on every defensive snap of his career would be a bonus they're not counting on yet. Sign up for "Early Birds," our new Eagles newsletter by Zach Berman, at philly.com/earlybirds.